☞ SMART PORTS: Dual-USB smart charging ports automatically detects your device to deliver optimal charging speeds. 2.1A / 1A Wall Plug Adapter Outlet provides plenty of power to fast charge 2 devices (tablet, cellphone) at the same time. ☞ UL CERTIFIED: This charger reaches the rigorous safety standards of Underwriters Laboratories, designed with over-heated, over-current, over-charging safety protections keep superior performance and reliability. ☞ COMPATILABLE WITH: Use for Apple iPad/ Air2/Air, iPad5/iPad4/iPad3/ iPad2 / Apple iPhone SE/6/6S/6 Plus/ iPad Mini3 /iPad Mini /Samsung /HTC/Sony etc. ☞ PORTABLE AND SAFE DESIGN: It's weight light and small , easily portable, perfect for traveling. 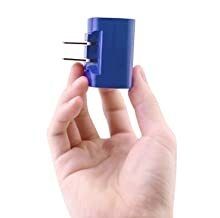 It contains internal protection mechanisms, and a blue LED power indicator to let you know when your phone is charging. 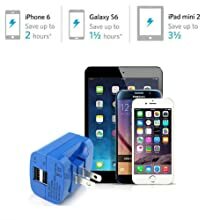 Will the charger automatically stop charging once the battery has reached a full charge. ☞ LIFETIME SUPPORT GUARANTEE: Our friendly and reliable customer service will respond to you within 24 hours! You can purchase with confidence, with our 18 month replacement warranty, or 30 days money back guarantee and of course our lifetime support guarantee! 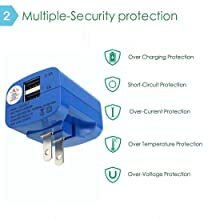 Are you looking for a mobile phone charging head? But also a dual USB charging charging head? Then you come to the right place! 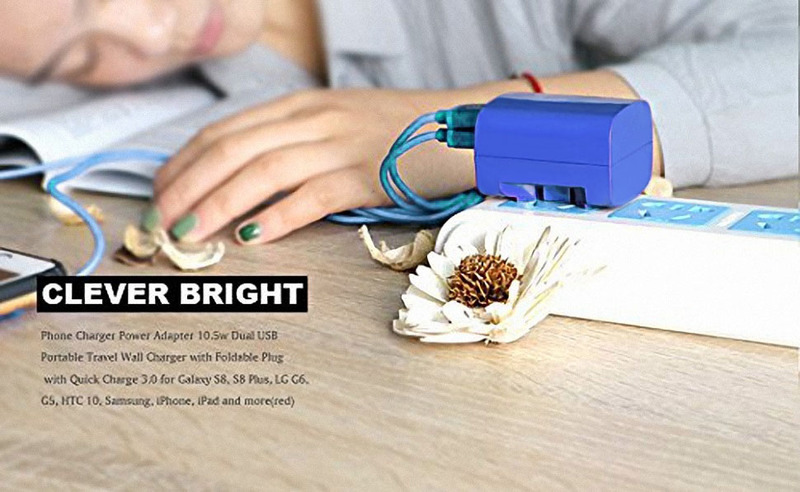 CLEVER BRIGHT dual usb charge head is your best choice! charged fast, thanks to its smart IC. Exclusive to CLEVER BRIGHT, ensure the maximum possible charge speed. -Automatically switch to protected mode when the battery is fully charged. -Compact and light weight small size, easy to carry, Convenient to use for home, office and travel. 2 ports pump out 10.5 watts of power, enough to simultaneously charge two devices at full speed. Your device is plugged in and charging. Compact and light weight small size, easy to carry, Convenient to use for home, office and travel. 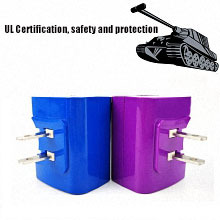 CLEVER BRIGHT Wall Chargers all have through UL certification, are safety and protection. 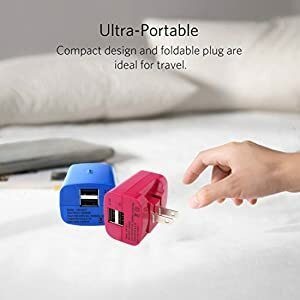 Incredibly compact design with foldable plug makes it one of the most portable dual-port USB chargers on the market.